If you have been friends with me for any length of time, you already know that I was lucky enough to have a fabulous vacation in France just about a year ago. I traveled in a group of eight friends and family and it was an amazing trip. Anyway, since I was feeling nostalgic for our trip, I checked one of my favorite “set in Provence” films out of the library — again. 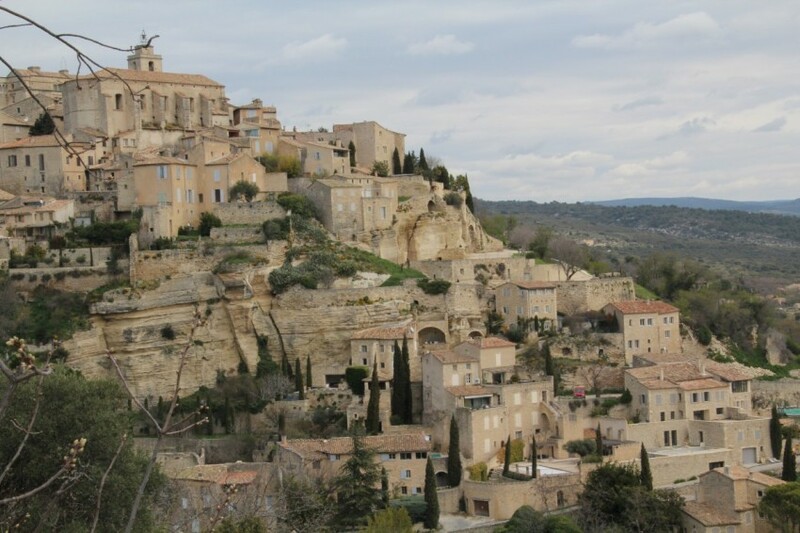 A Year in Provence is a British made-for-television adaptation of Peter Mayle’s book of the same name. 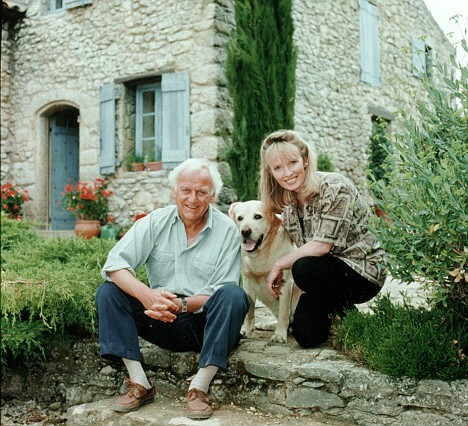 Both the book and the television series chronicle Peter and his wife’s first year of retirement after buying a beautiful home in southern France. Starring veteran English actors John Thaw and Lindsay Duncan, the episodes are a relatively faithful adaptation of Mayle’s book. 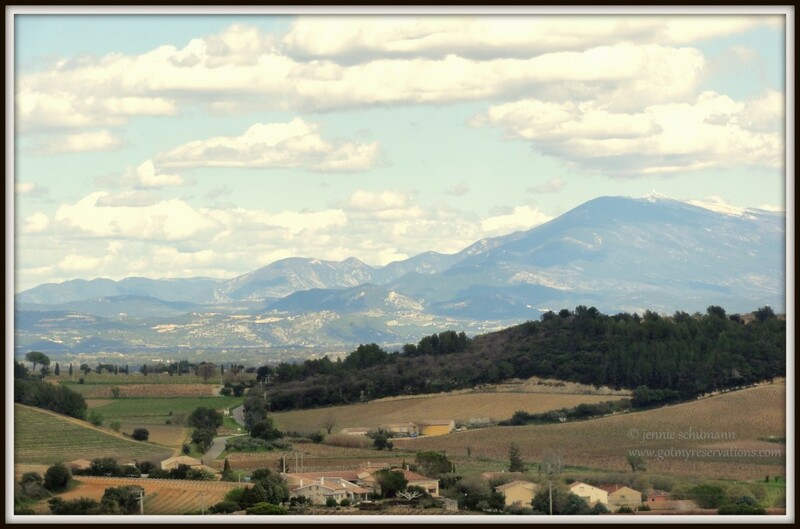 I have probably watched A Year in Provence ten times, but this time, I saw it in a new light. 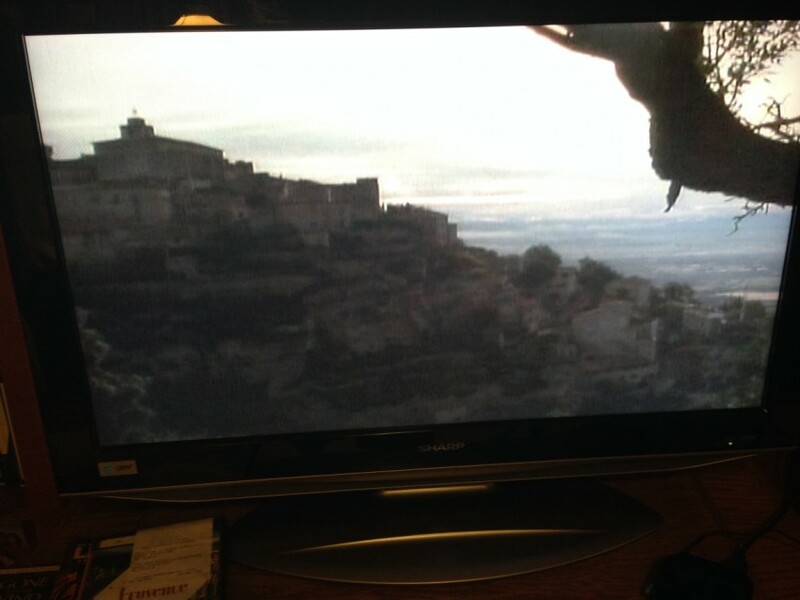 In fact, I posted a photo of my television on Facebook to show the France Frolickers that we had essentially the same photo that was in the the film. There were comments and scenes about Provençal institutions, such as the filmmaker Marcel Gagnol and the ubiquitous game of boule (here in the United States, we usually call it bocci — an Italian game that is very similar). And then there’s the story of the truffles, a theme which follows the entire year portrayed in the book. 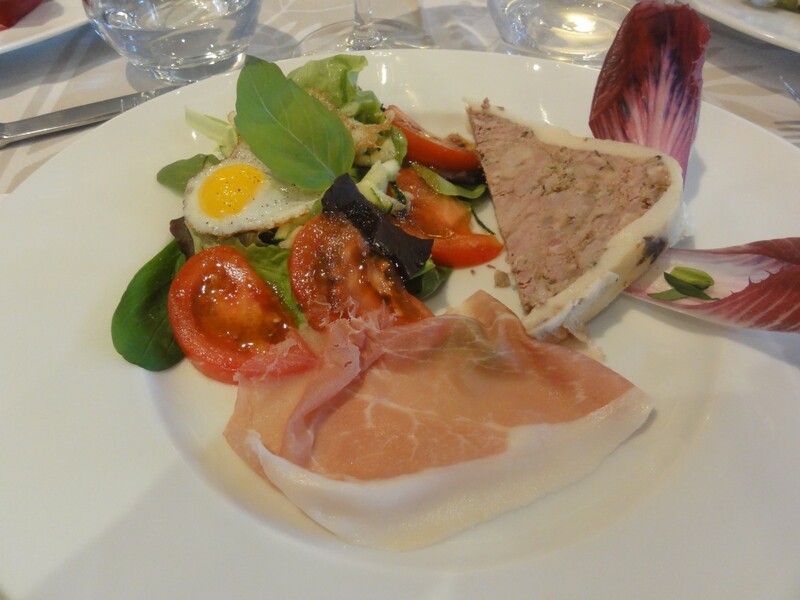 Thinking about truffles brought me back to the fabulous meals we shared while in France — day after day of gourmet cuisine that I’ll never forget. 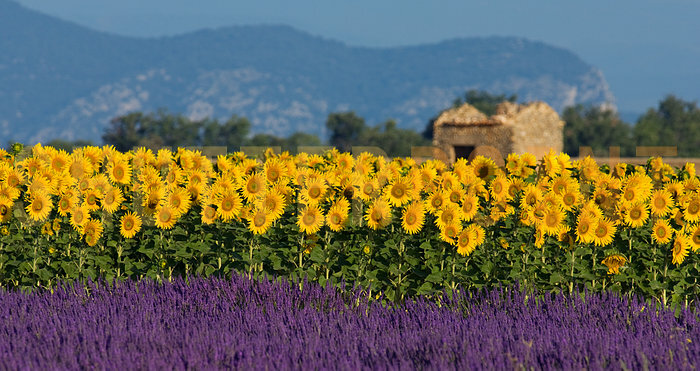 If you are planning a trip to Provence or have already been there, give yourself a treat and watch A Year in Provence. It’s got its faults — not everyone loves Peter Mayle and his bumbling behavior, but there’s a lot to love in this series. This post includes affiliate links. Please see my advertising disclosure for details. 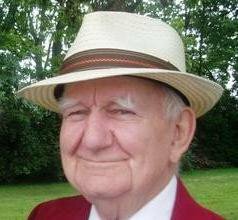 This post contains affiliate links; see my PR disclosure policy for details. What is it about the Mona Lisa that makes her the media sensation she’s been for centuries? 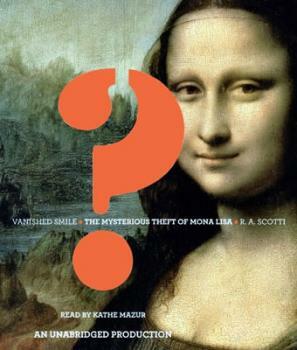 R.A. Scotti’s book, titled Vanished Smile: The Mystery of the Mona Lisa, attempts to answer that question. 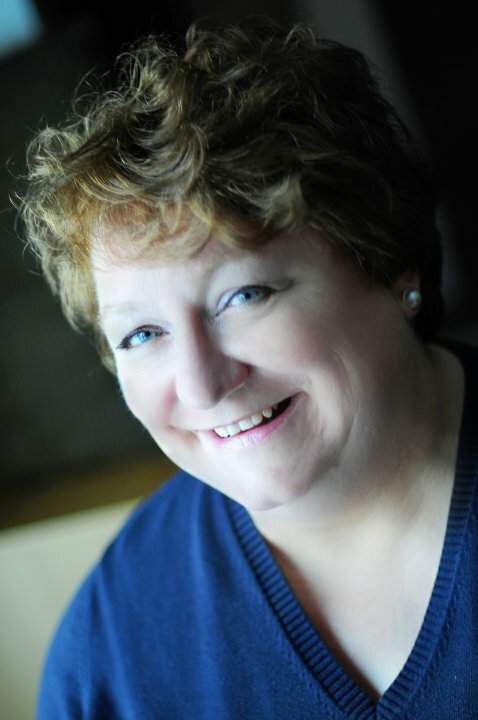 The book centers on the theft of the Mona Lisa from the Louvre in 1911, and Scotti uses her crime-writer skills to build a past, present, and future for perhaps the most famous smile in the world. Pretty much everyone in the art world got involved, including an attempt to pin the theft on Pablo Picasso and Guillaume Apollinaire, who were both considered anti-establishment artists and possibly revolutionaries in pre-war Paris. In our book club, people sometimes bewail the contemporary practice of skipping around from time period to time period and from character to character without a lot of notice. This book, however, is not one of those. Scotti tells the story of the theft and the attempts to recover the painting in a pretty linear fashion, but also includes the history of the painting and its artist, Leonardo da Vinci. It’s a fascinating read by a master storyteller. The Eiffel Tower is lit up at night on the hour and twinkles merrily for about five minutes. It’s worth the wait. I’m linking up with Travel Photo Monday” at Travel Photo Discovery, Wordless Wednesday at Moving Through Life, and “Travel Photo Thursday” at Budget Travelers Sandbox, so stop by and get some more inspiration for your travel bucket list! Did I tell you about our family reunion this year? We’ve been having family reunion weekends annually for thirty-one years. Although not everyone comes every year, we have decided that if we don’t have the reunion annually, it could easily die a quick death and we don’t want that to happen. One of the gifts of having an annual reunion is seeing one’s younger relatives grow up and prosper — especially the children. This year, my cousin asked me to photograph her five grandchildren while at the reunion, and with some trepidation, I said I would. They were adorable and I got some fun pictures that expressed the children’s personalities, even though I’m an amateur photographer. 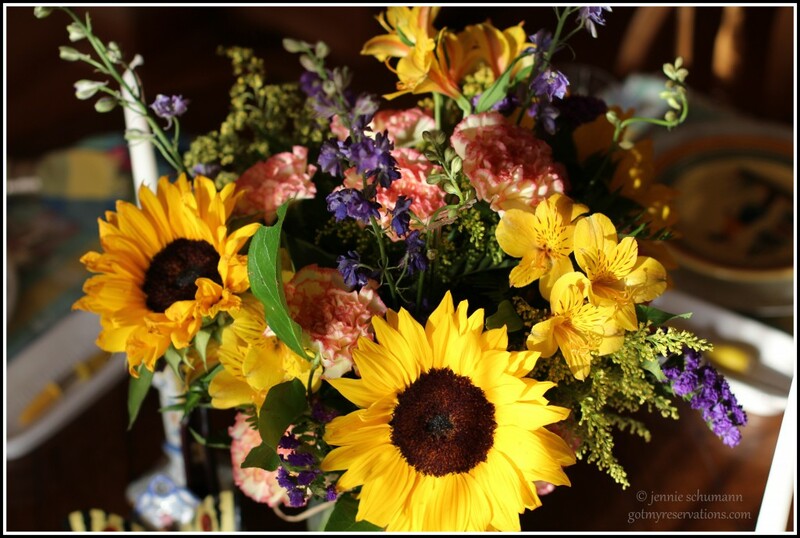 As a thank you for my time, my cousin sent me a beautiful flower arrangement, and today’s sunflower tablescape was inspired by her thoughtful gift. 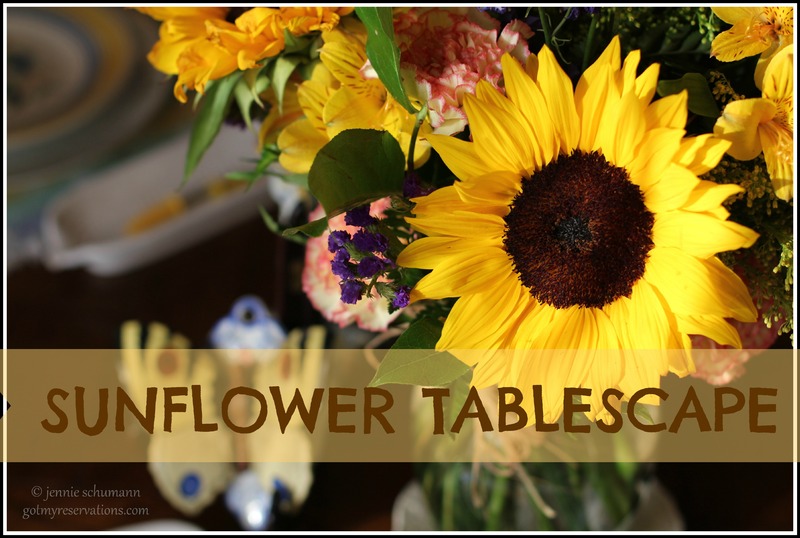 As I started to put together the elements of the tablescape that would complement the sunflowers, I didn’t really think I had enough yellow to make it work. 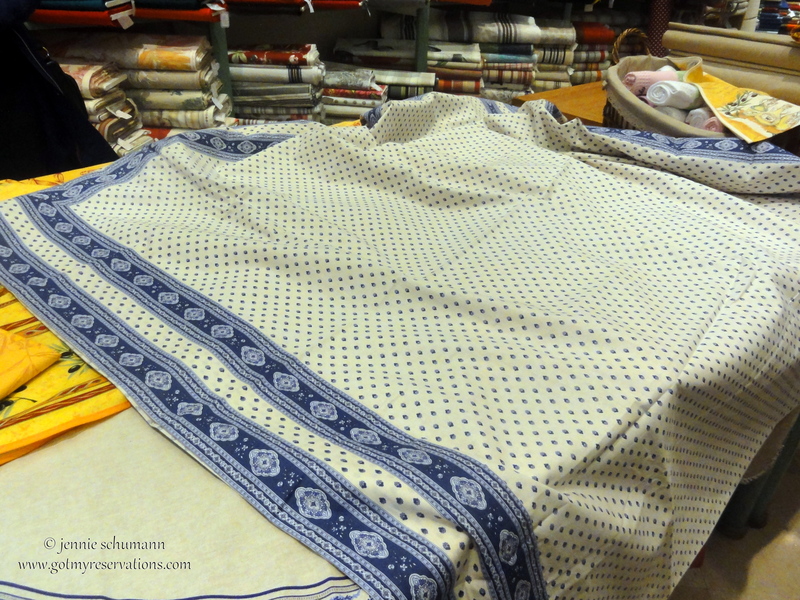 Then I took a trip to the linen closet, where I found the coordinating placemats and napkins with yellow stripes and checks. It was still pretty pastel and the napkins carried a lot of pink, so I added a few pink-tipped carnations from the grocery store to the arrangement. 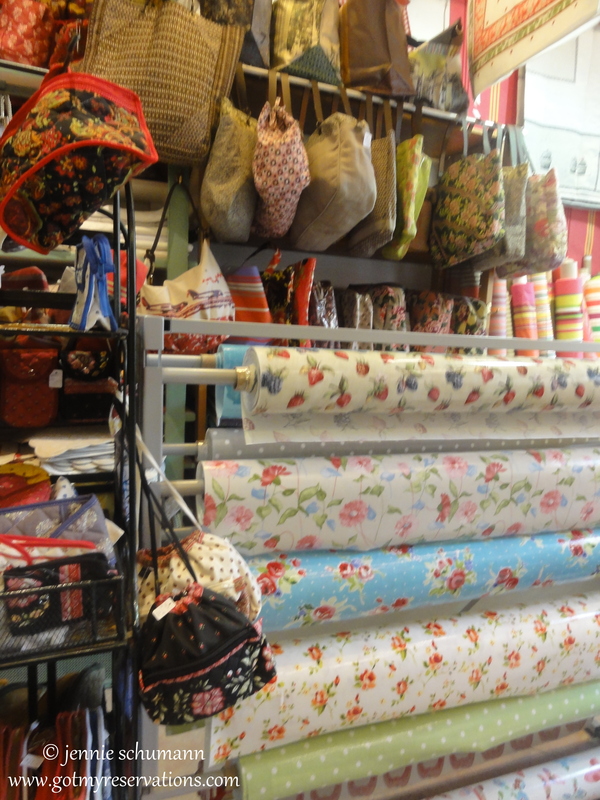 Then I began shopping for dishes in the cupboards. Of course, I had to start with my signature style — using grandma’s china and silver. This pattern, Stanwyck by Noritake, belonged to my next door neighbor and when she died, her kids gave me the entire set. 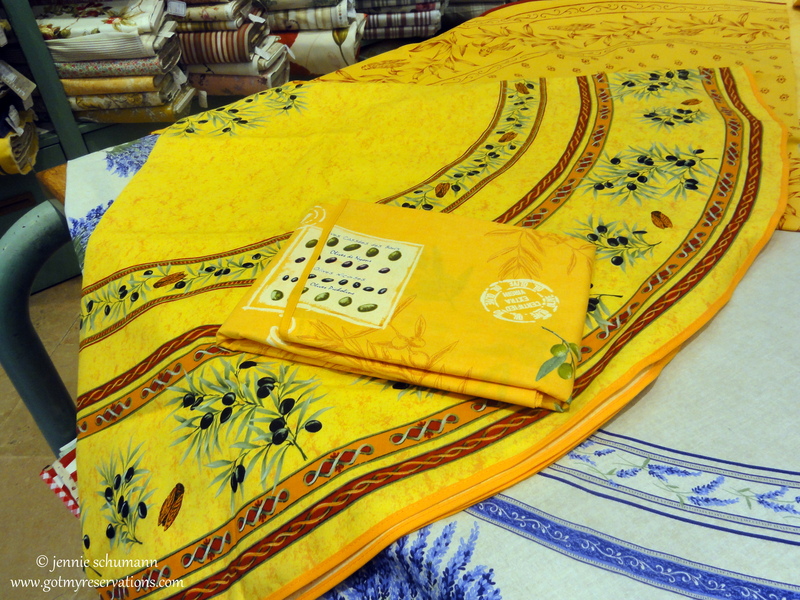 The fragile blue and gold filigree pattern balances the bold orange and yellows of the Quimper salad plate. 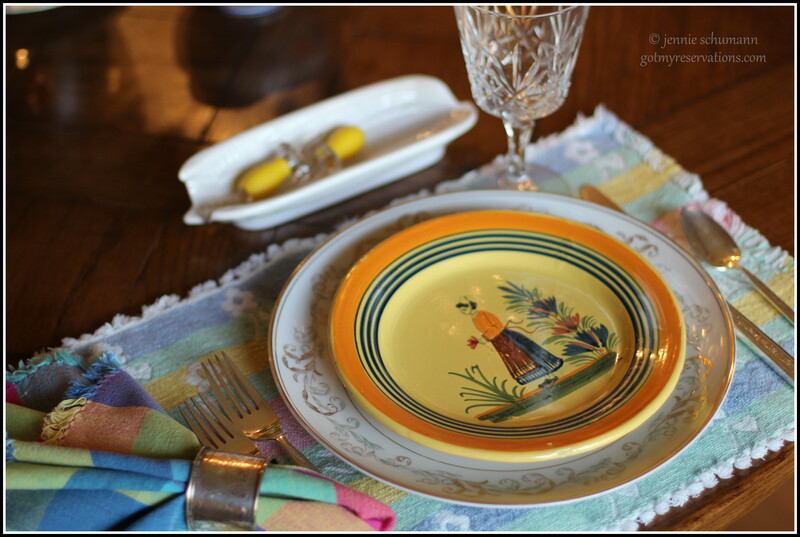 While reading blogs this morning, I saw a post from Dawn at We Call It Junkin where she used her corn on the cob plates in her design. Brilliant, I said to myself, and since imitation is the highest form of flattery, I added my white stoneware corn dishes to the table with their yellow corn stickers. Who said I didn’t have any yellow stuff in my stash? 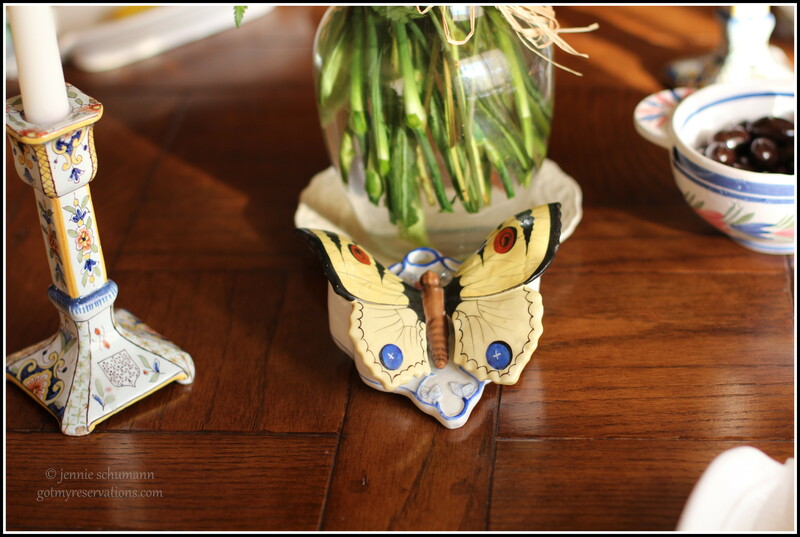 After that it was easy — just pull more French pottery from my collection courtesy of my beloved mother-in-law, including the Quimper candy dish filled with dark chocolate coated almonds, a pair of candlesticks, and a French butterfly. I added our wedding crystal, silver napkin rings, and my Gorham Trilogy flatware and got out the camera. Voila! 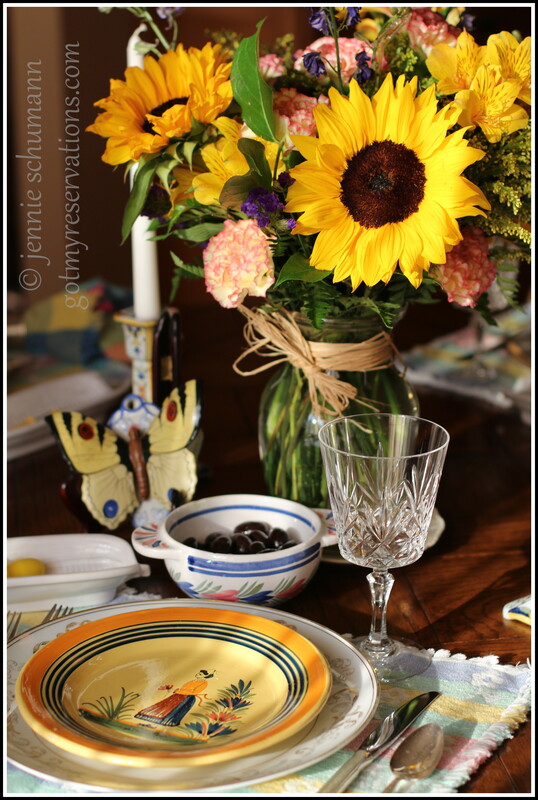 A sunny tablescape inspired by the sunflowers of southern France and enhanced by my collection of French faience. I’m pretty sure my mother-in-law would have loved the whole thing, and I miss her most at this time of the year because she’s not there to share the family reunion with us. Family is a true gift that cannot be underestimated or forgotten. 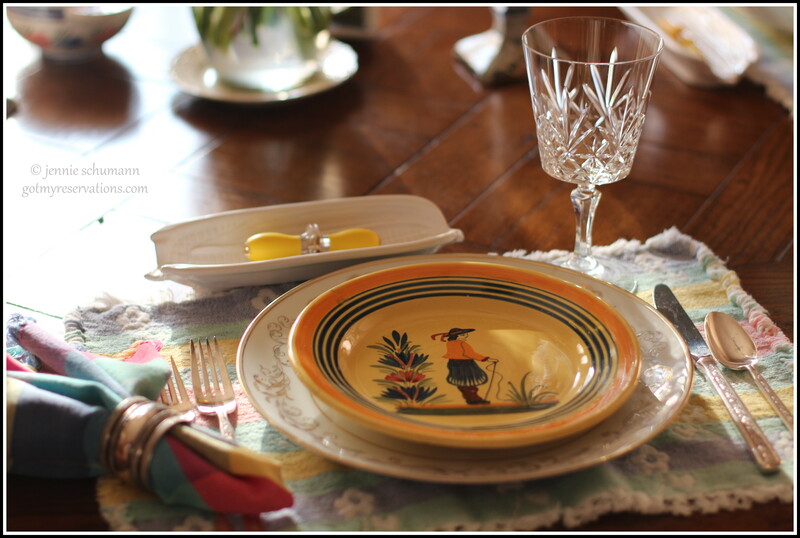 I’m linking up this week at Let’s Dish with Cuisine Kathleen for the Summer Fun Challenge, Open House Party with No Minimalist Here, and Tablescape Thursday at Between Naps on the Porch. Be sure to visit these creative bloggers for lovely photos and inspiration. With the availability of bicycle rentals in so many cities, travelers have the option of getting some exercise while seeing the sights from a different vantage point. 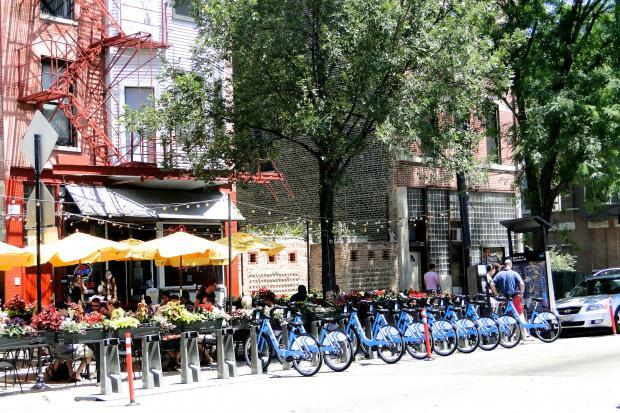 Here in Chicago, Paris-style Divvy bike racks are popping up all over the city, and not just along the lakefront. I’m not talking about you hard-core folks who go to Provence on bicycling tours, but with soft-core city cycling comes the need for soft-core bicycle clothing and gear, and that’s where we’re traveling today. 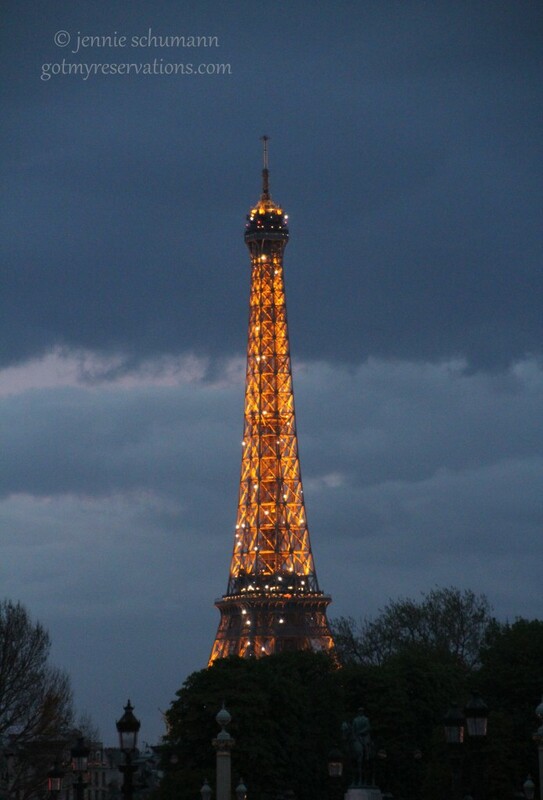 Looks like Paris, doesn’t it? But it’s Chicago! As a middle-aged woman, the last thing I want to do is wear skin-tight bike shorts around town while sightseeing or going into a restaurant. I was thrilled when a friend referred me to Terry — the “original women’s bicycling store.” At Terry, I found the perfect solution to my dilemma, the padded bike skort. 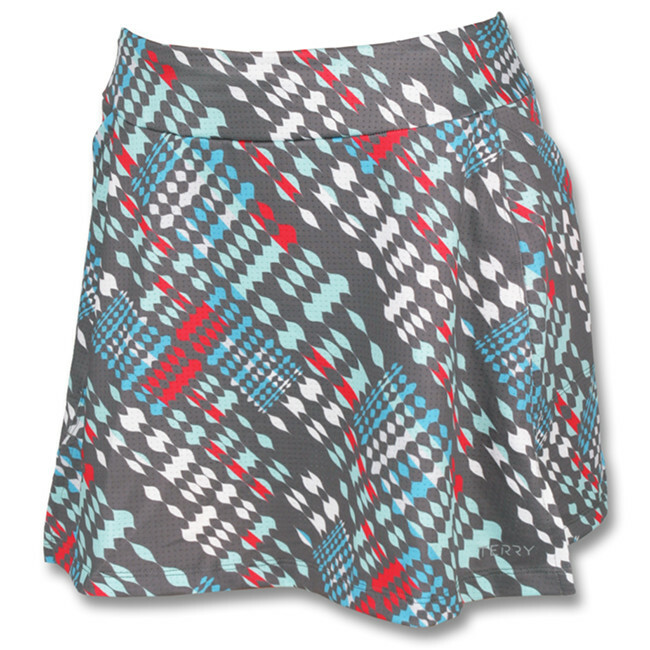 Terry’s Flare Skort is the perfect solution to bicycling in cities. I own this skort in the print and in black. It has a padded bike short underneath with leg bands that are not too tight, and the skirt has two large hip pockets where I put my iPhone and use the Map My Ride app when riding around town. It comes in plus sizes and is comfortable enough to walk around in, even with the padded seat. It hits me just above the knee at my 5′ 2″ height, and is a respectful length. Normally I wash my bike gear in my washing machine, but this week I washed it in the bathtub (as I usually wash clothing while traveling). The padding took two days to dry, so be aware of that, but I probably could have squeezed out more water with towels. It will fold up into a small ball in the corner of your suitcase and come out looking brand new. All over Europe, we have seen women commuting on bikes, dressed in their work clothes. I don’t know if they are wearing bike shorts underneath their dresses, but they could do that as well. With a simple bike short liner under your dress, you can pedal in comfort and modesty even in your cute sundress! 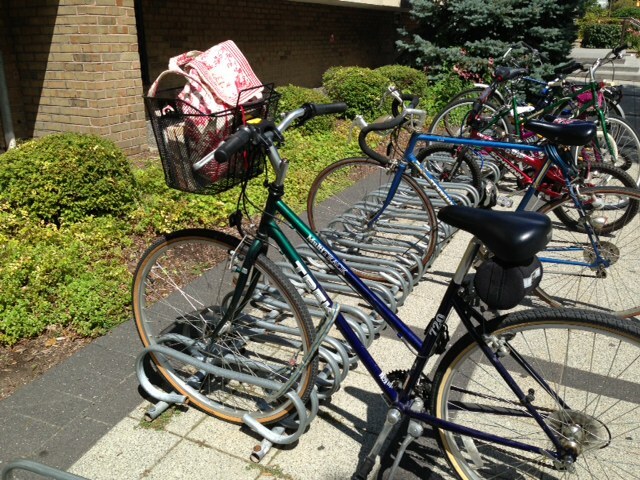 With a basket and my bicycle togs, I can get my exercise and my errands done. I also picked up an old Vera Bradley small backpack at a garage sale this summer, and was really excited about it. It’s lightweight and breathes, so even if I actually carry it on my back, it’s comfortable. It’s big enough to put my wallet and my camera in it, leaving my removable basket for library books, groceries, or goodies from the farmers’ market. 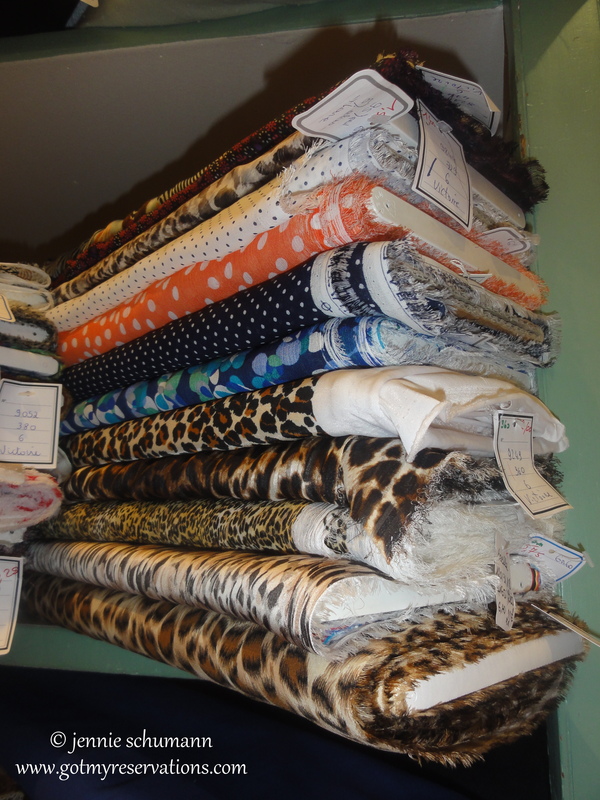 It’s a win-win, both at home and while traveling, but I would choose a more sedate pattern to use in Paris :). I’m linked up today to Wanderlust Wednesday at Time Travel Plans, The Tablescaper for “Oh, The Places I’ve Been”, Travel Photo Monday” at Travel Photo Discovery, and “Travel Photo Thursday” at Budget Travelers Sandbox, so stop by and get some more inspiration for your travel bucket list! 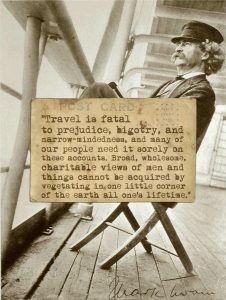 We all have our things that we want to buy when we travel. Some of you buy art, and some buy jewelry. 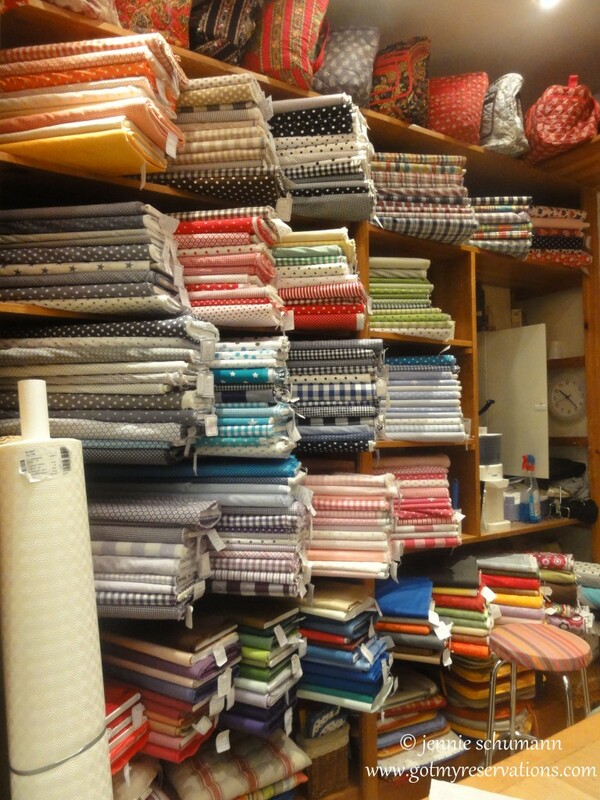 My thing is linens. 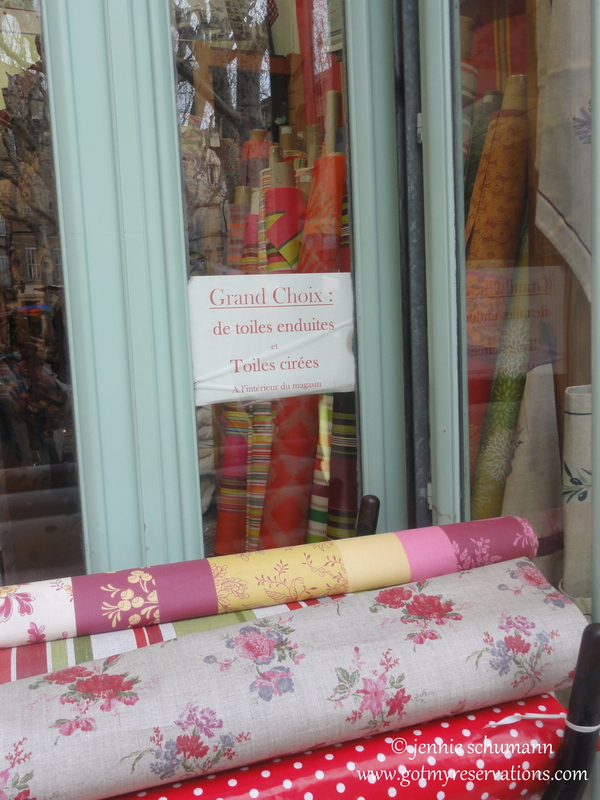 I was determined to bring home at least one gorgeous Provencal tablecloth when we went to France in April. 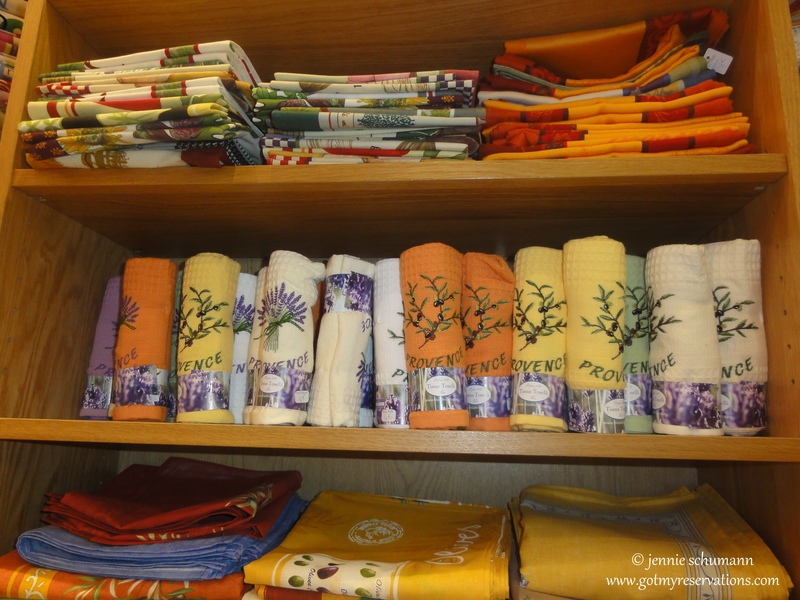 Normally, I settle for interesting tea towels and pot holders when we travel, but there was no chance I wasn’t going to bring home a special keepsake from our Provence trip. I won’t keep you in suspense; this is the one I bought. 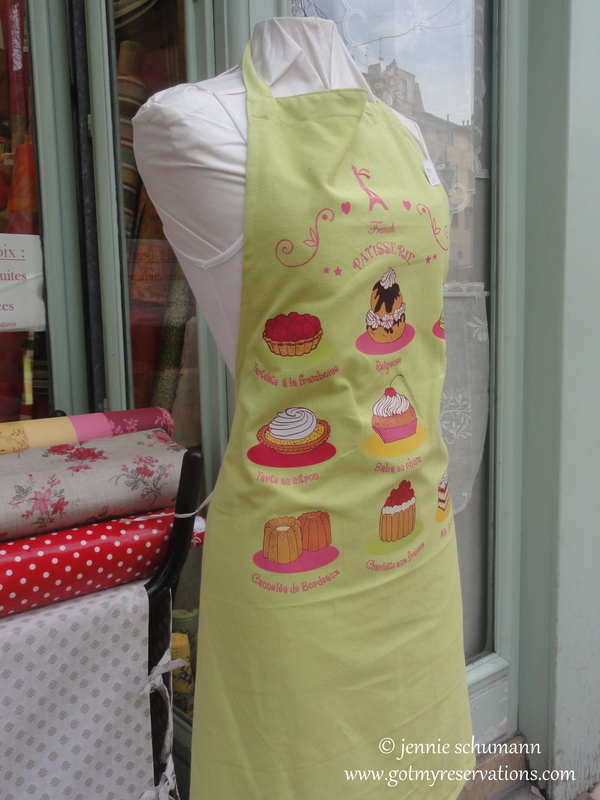 On our first full day in Aix-en-Provence, I spotted La Victoire on the Rue Vauvenargue. 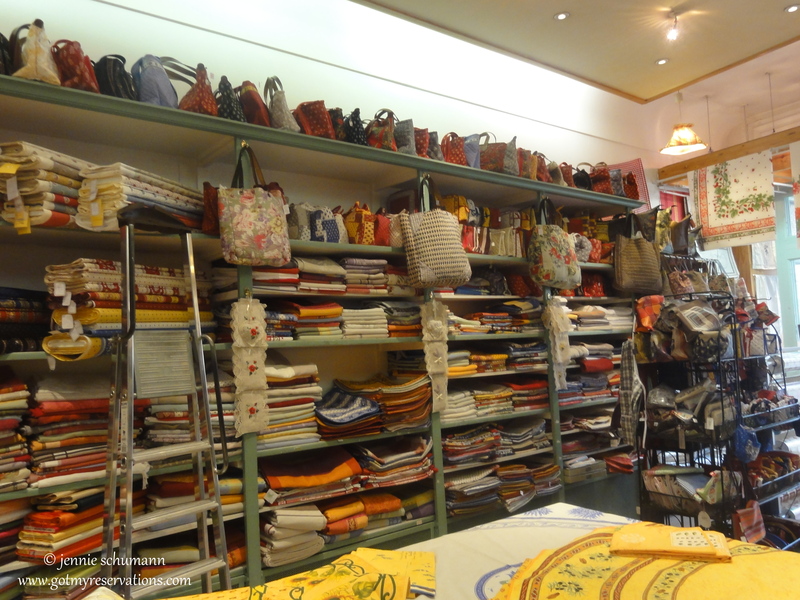 While the men hung out at the market on the square, I made a beeline for the shop with my female traveling companions. 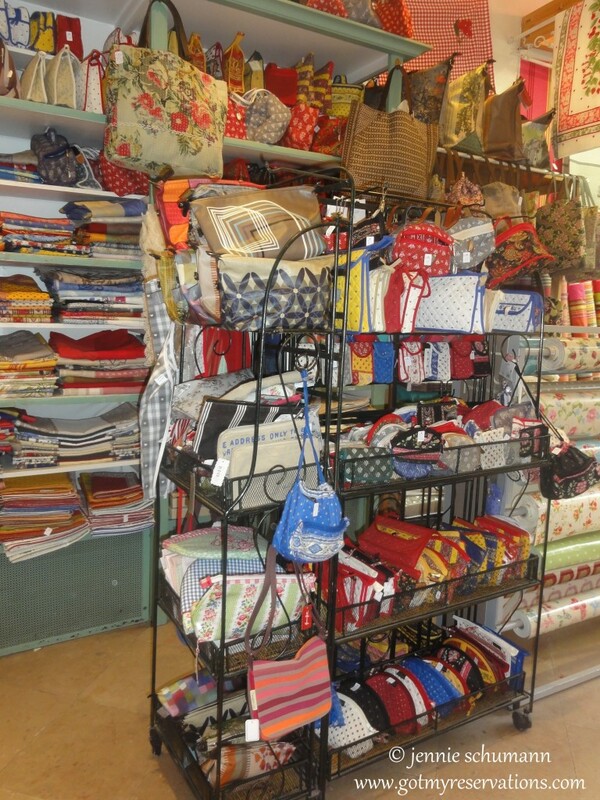 …and bolts and bolts of charming fabrics. 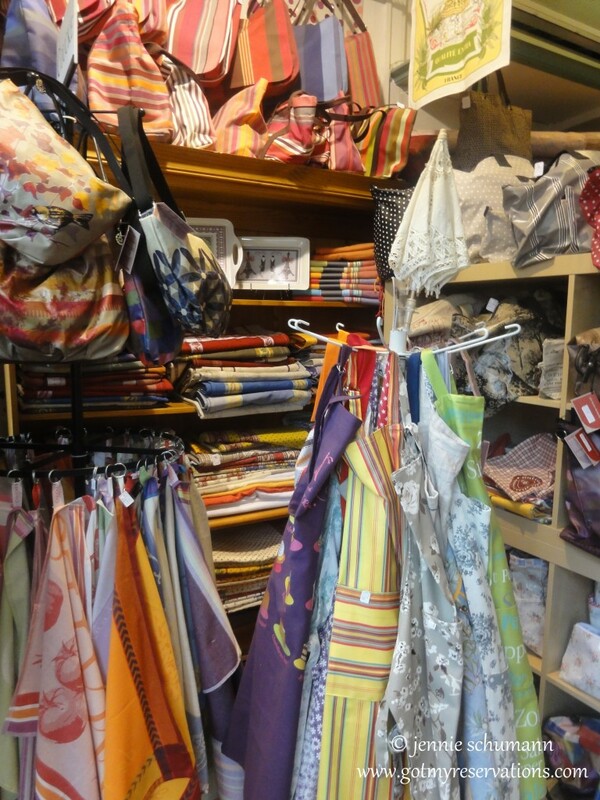 … and bags of all sorts made from Provencal fabrics. 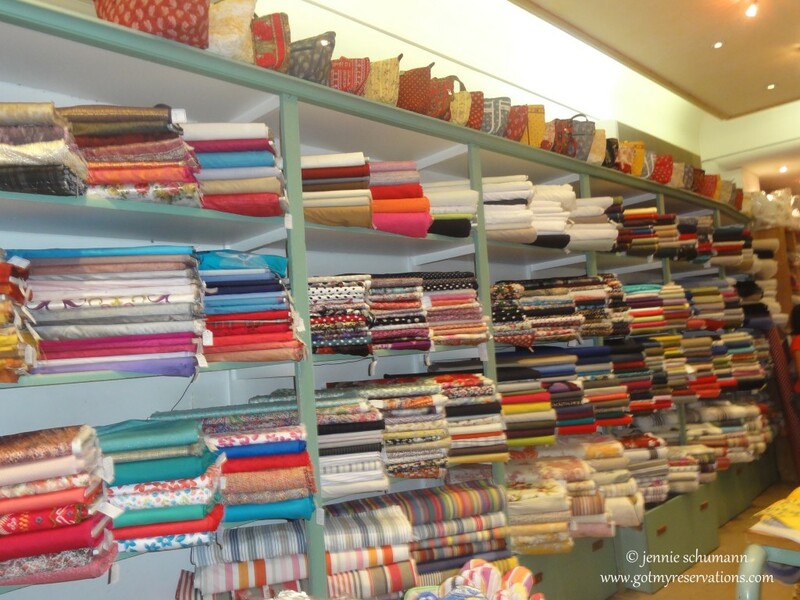 I didn’t have nearly enough room in my suitcase to bring home everything I wanted to buy, but I was really coveting the coated fabrics — so practical! 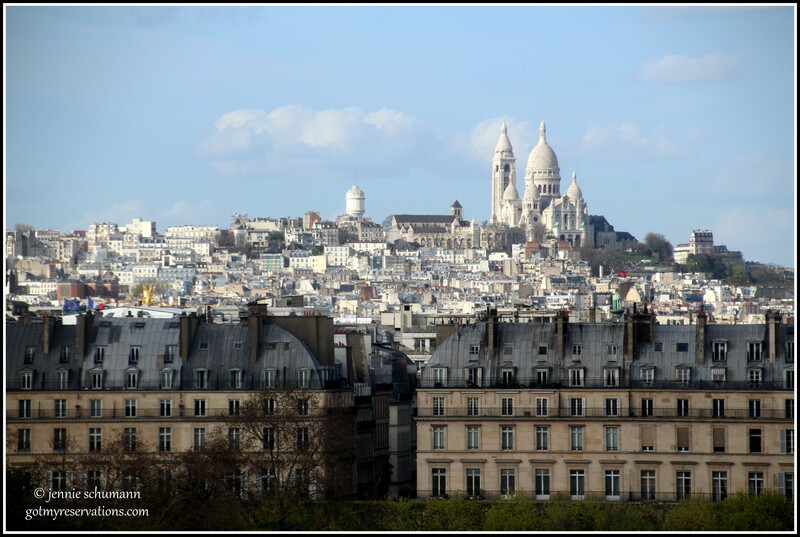 If you haven’t climbed up to Sacré Cœur in the Montmartre neighborhood of Paris, you haven’t actually lived Paris. Walking in the footsteps of the artists and performers, ladies of the night, and now millions of tourists, the narrow winding streets of Montmartre take you back to another time. 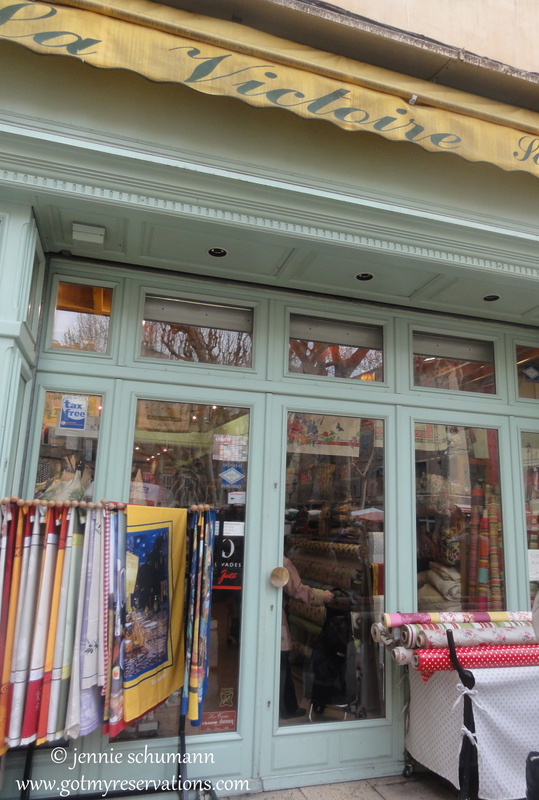 Because its architecture and character is protected by a historic district designation, Montmartre doesn’t change much. I recommend getting Rick Steves’s Montmartre Walk on Kindle for your smartphone or iPad and follow the tour up the hill. We did this on a sleepy July morning and by the time we got to the top, we were ready to enjoy the quiet reverence of Basilique du Sacré-Coeur de Montmartre. And the views from the top are worth every step! 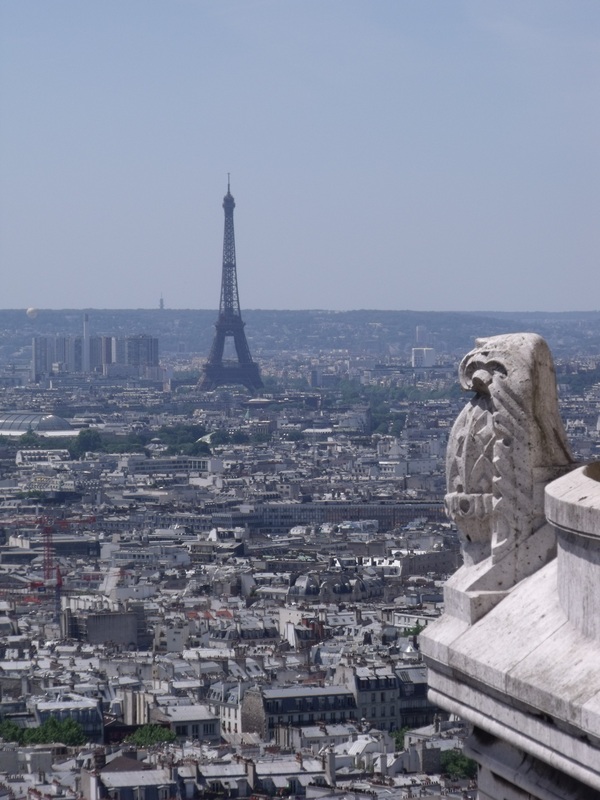 View from the top of the Sacre Coeur Basilica. I’m linking up with The Tablescaper for “Oh, The Places I’ve Been”, Travel Photo Monday” at Travel Photo Discovery, and “Travel Photo Thursday” at Budget Travelers Sandbox, so stop by and get some more inspiration for your travel bucket list! 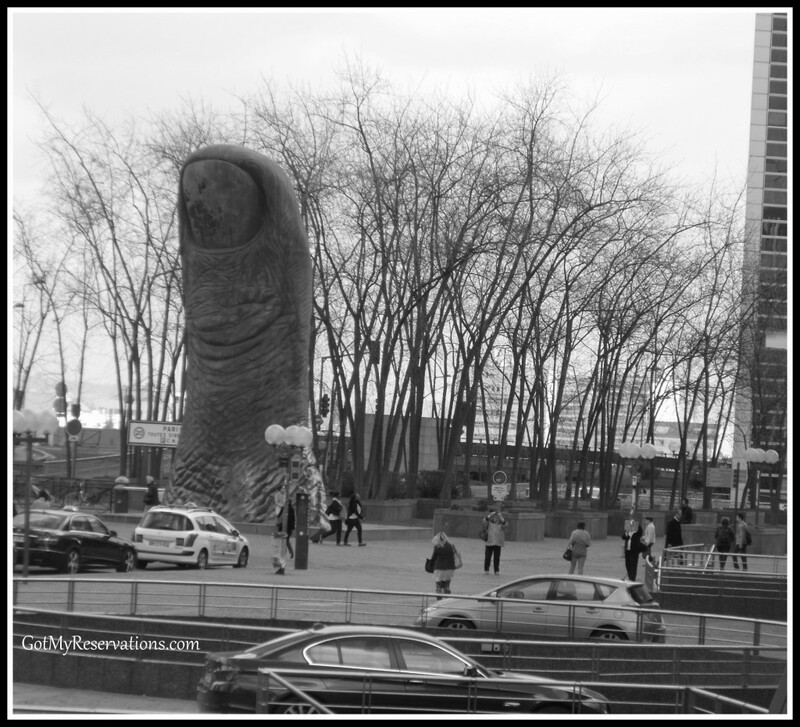 Sculptor César Baldaccini’s sculpture Le Pouce (The Thumb) stands in direct contrast to the modern office buildings in the La Défense section of Paris. Built in 1965, it literally puts a finger on the pulse of Paris’s business district. 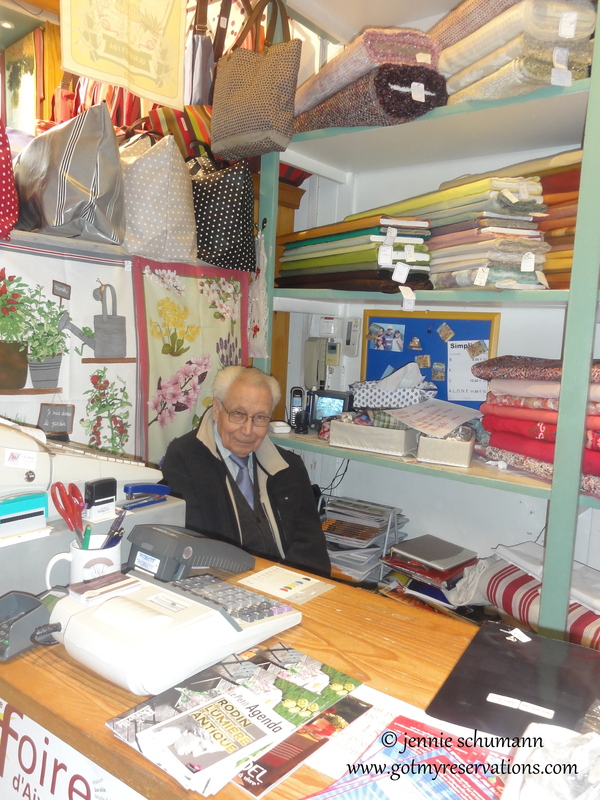 You can read more about César Baldaccini here.